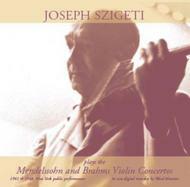 Szigeti [1892-1973] was an artist of rare intellect and integrity; he eschewed the role of virtuoso, placing himself totally at the service of the music. In addition to the standard repertoire, he championed the music of many 20th-century composers including Stravinsky, Bartok, Ravel, Prokofiev, Honegger, Bloch and Martin. These rare New York airchecks find him still in fine shape, before arthritis began seriously to affect his tone.